Do you remember the episode of “No Reservations,” where Anthony Bourdain was in Ubud, Bali and said that the mouth-watering babi guling, or roast pig, was the best that he’s ever had? Well, that was at Ibu Oka, and the pork they dish out is tasty. It’s been stuffed with garlic, galangal, turmeric, lemongrass and chili. Then, it is basted with coconut milk and cooked outdoors for five hours. This isn’t fancy food. 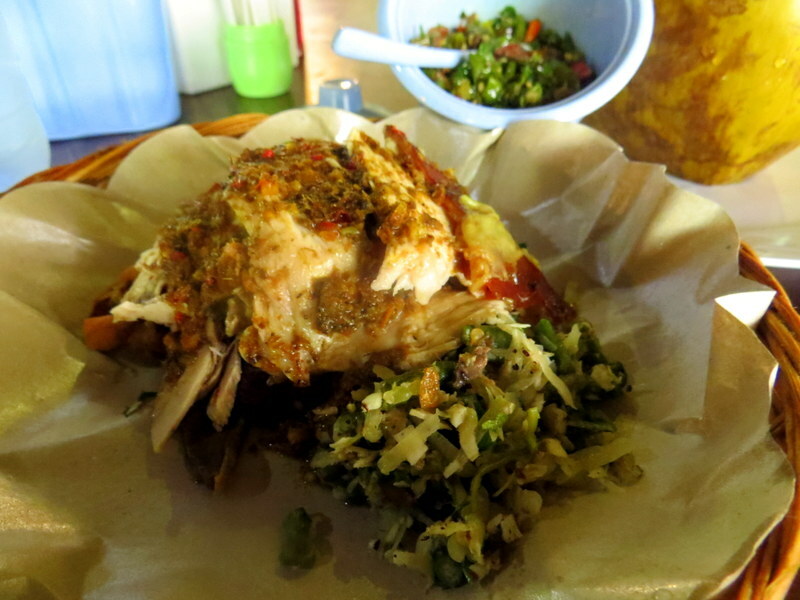 This Balinese specialty is served in simple surroundings, and here, it’s all about the pig. I like the mixed plate which specializes in the tender meat, a little of the skin, some fried intestines, and the delicious blood sausage. It also comes with rice, spicy vegetables, and Ibu Oka’s secret sauce which really makes the pork come alive. Ibu Oka’s fame has caused them to now open three locations. And, along with the expansion of the locations, unfortunately there has also been an expansion of price. The mixed sampler plate is 45,000 rupiah (about $3.70 USD) and 60,000 ($5 USD) for the plate of skin which is the truly decadent part. 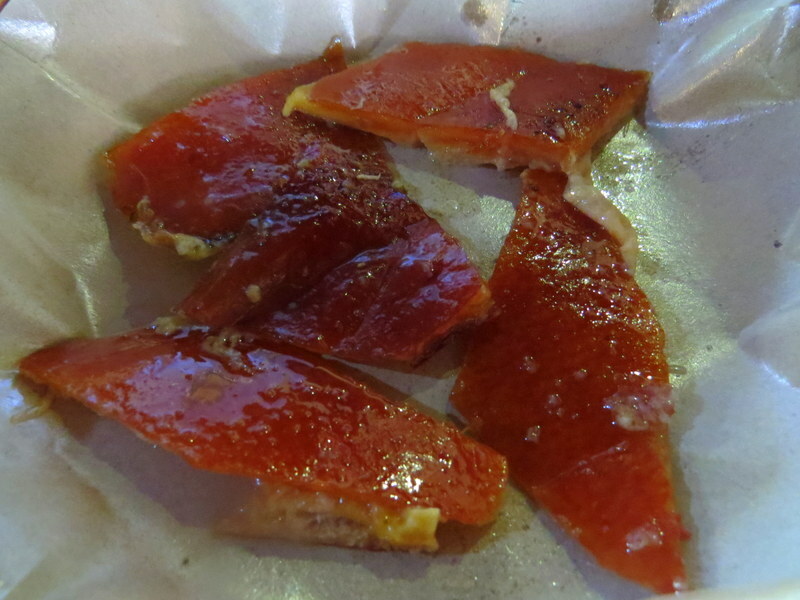 (I don’t think they give you enough with the main plate, so I like to order a plate of the skin on the side). 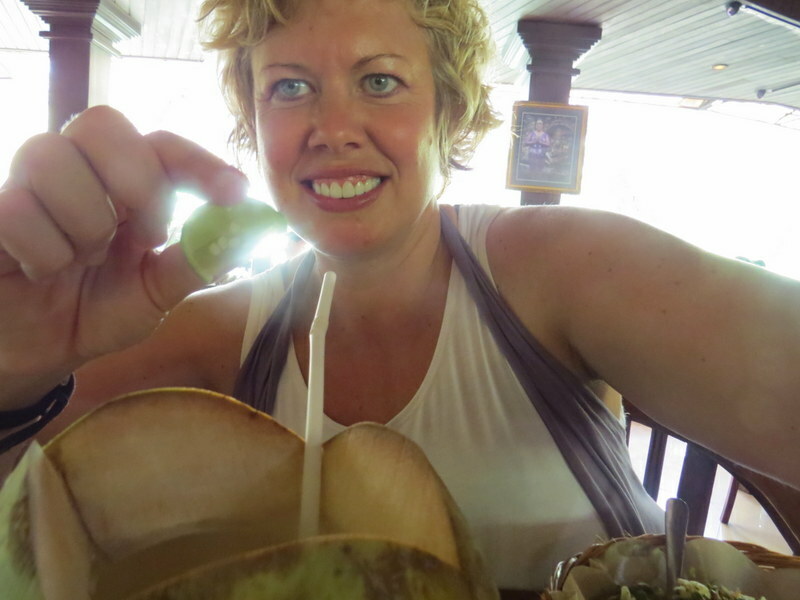 With drinks, it can come to an expensive meal by Bali standards. You must go early to experience Ibu Oka’s, as they tend to start running out of food as early as 12 noon. (They go through about thirty pigs a day.) This tends to be the haven for many Japanese bus tours, so it can get very busy. I, myself, will be in search for some more authentic babi guling while I’m here in Ubud. I’ll keep you posted on what I find. 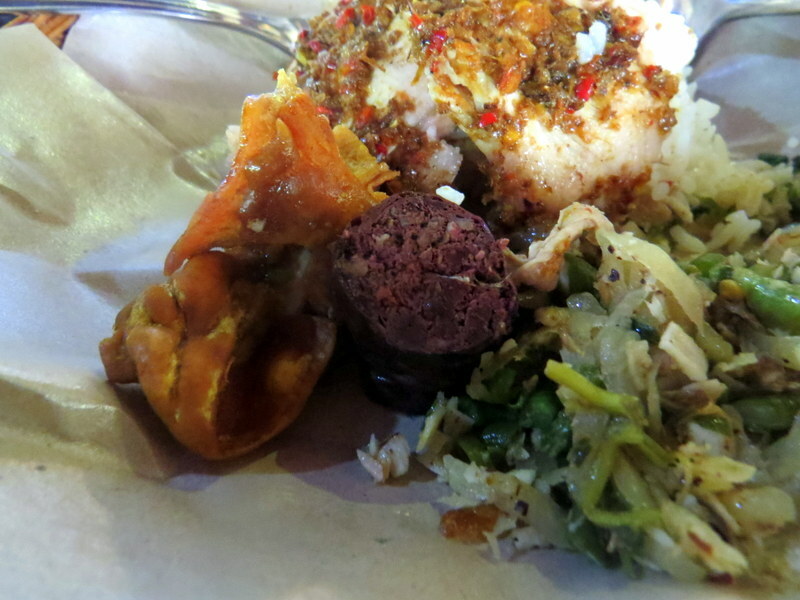 6 Responses to "Ibu Oka-The Pork That Anthony Bourdain Ate In Bali, Indonesia"
Thank you for introducing this Balinese original food. I recently went to Bali and although it was recommended to us, we weren’t able to get there in time for a lunch time to try this in Ubud and I believe it’s only really in earlier in the day, as you say. I was disappointed not to have been able to try it but I didn’t realise it had become so modernised and even too expensive for many locals, which I agree is quite sad if that’s the case. Yes, it’s lost a lot of the character it used to have. It’s still good, but there are better places now. It used to be a lot better, but their popularity has made the quality go way downhill….